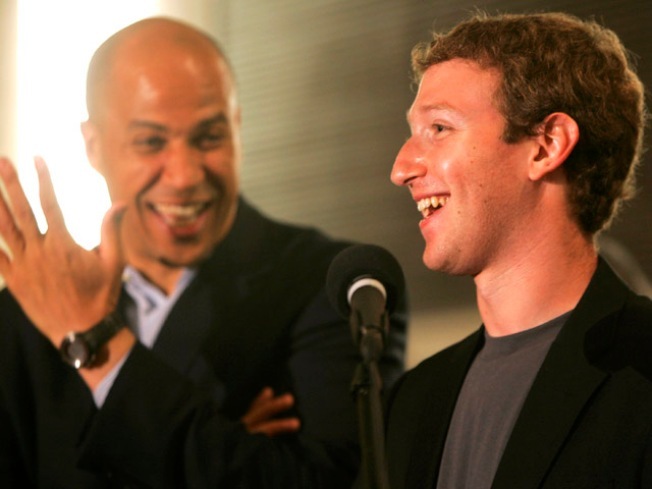 Newark Mayor Cory Booker, left, laughs as Mark Zuckerberg, right, founder and CEO of Facebook, talks about his donation of $100 million to help Newark public schools during a press conference at the Robert Treat Hotel in Newark, N.J., Saturday, Sept. 25, 2010. Also there is N.J. Gov. Chris Christie, not in picture. We didn't get a chance to find out a lot of detail about his visit, but when Facebook founder and billionaire philanthropist Mark Zuckerberg came to Newark Saturday, he stopped in at one of the city's charter schools, along with Mayor Cory Booker. The lucky school was the Team Academy, across from City Hall, and one of many charter schools in Newark that hold Saturday sessions--usually half days. A little later, Zuckerberg and Mayor Booker reunited with Governor Chris Christie some 28 hours after their Oprah appearance, to elaborate on the $100 Million challenge grant the 26 year old is giving to Newark schools, a gesture that is making waves across the country. Zuckerberg at that point made it clear "We're doing this to give Mayor Booker and Governor Christie as much flexibility as possible." Booker made it clear that when it comes to reform, "Everything is on the table." And Governor Christie, a republican who is making democrat Booker his point person(the State of New Jersey took control of Newark schools 15 years ago) added "I'm not going to tolerate anymore the obscenity of children being deprived of their future." The challenge grant requires Booker to raise $100 Million from his sources, something the Mayor said he is prepared to do. '"We're getting extraordinary offers of support from around the country, and from Newark," Booker responded when asked if he can match the Zuckerberg grant. Governor Christie, when asked about reported criticism from the teacher's union, responded, "We're about 'yes,' they're about 'no.' We're about tomorrow, they're about yesterday. We're about the kids, they're about their paychecks." The governor said he will be holding two education round tables next week, and will start rolling out his statewide education plan during the next several days. Booker made it clear he does not expect to be deciding how to spend the money, but said it is up to the community. "Newarkers have to define what great education should be," Booker said while adding that community forums will begin sometime in October.